You probably already know, but in case you missed it, check out Robert Rogers story in the Contra Costa Times. The Court documents are attached and viewable in the story. Do you think they use plastic zip-ties or handcuffs for Chevron? The Company pled no contest and agreed to the terms of probation because it was the quickest way to bring closure to this issue allowing us to focus on actions that will make our refinery processes better. Submit reports to the Contra Costa County DA's office, the CA Attorney General's Office, BAAQMD and Cal/OSHA every 90 days reporting progress in implementing these conditions for the 1st year of probation and every 6 months thereafter until the period of probation ends. � And finally, we are agreeing to pay approximately $2M in restitution and fines to local agencies, including BAAQMD, Cal/OSHA, and the California Attorney General's Office. The attached information from the San Francisco Chronicle is shocking and says most of what needs to be said. Despite the refinery fire and high asthma and cancer rates in the area surrounding the refinery, this monitoring system project has been repeatedly delayed. I think the City Manager, speaking for the city, should demand of Chevron that this project be completed immediately, And if the project is not completed by the time the Council resumes meeting in September, then the Council should take urgent action to force this to happen. In the meantime, I urge neighborhood councils to take up this issue. Without this in place, we do not have proper evidence that the renewed operation of the refinery is functioning to assure clean air for ourselves and our children. There are other safety issues at Chevron that must be dealt with besides this and they may be as urgent. But Chevron promised this in 2010 and has still not delivered. Why should we assume that their other promises of safe operation are any better than this one? And why is the city allowing this delay? As this is going out, Chevron has released a letter saying that it is City delays that are responsible. At the July 30 city council meeting, the Santa Fe neighborhood demonstrated the vital importance of an organized community A holder of a city license for a marijuana dispensary applied to move into the Santa Fe neighborhood. At the beginning of the meeting it looked like the four votes needed to accept this request were in the bag. It appeared that several council members, including Jim Rogers and Jael Myrick. had negotiated a deal in which in exchange for council approval of the move, the dispensary would pay for two full-time police officers to patrol the Santa Fe neighborhood. There was also talk about money for scholarships for Santa Fe residents. Not to be bribed, the Santa Fe community mobilized against the proposal to bring a marijuana clinic to their community. Numerous speakers from the neighborhood, including Santa Fe Neighborhood Council President Jamie Holland, Rhonda Harris, and Linda Jackson Whitmore gave several reasons for their opposition Some opposed a policy change that would permit dispensaries in C2 districts. Others voiced concern about the fragility of the area and the potential negative impact of the dispensary on a neighborhood already struggling against drugs. Still others questioned the finances and the legality of the operation and whether campaign contributions were involved. Councilmember Jovanka Beckles stated that although she believes that medical marijuana provides compassionate care for some patients, there are already adequate sources to obtain it in Richmond. She emphasized a more important factor was the community's opposition to the dispensary in their neighborhood. Based on this neighborhood concern she made a motion to reject the application. Council members Rogers and Myrick attempted to convince the neighborhood members that it was really advantageous for them to get the two additional police and other benefits promised in the "deal." But the neighborhood stood firm. In the end Myrick voted for Beckles motion to reject the application. Booze and Rogers voted against the motion, and Bates abstained (which effectively counts as a no vote). What the "deal makers" did not understand is that the single most important factor in reducing crime and improving our city is involved community members. To discourage community involvement in exchange for two more police makes the neighborhood less safe. RICHMOND, CA.--Last Friday and Saturday were busy days for progressive mayor Gayle McLaughlin, She's the earnest, hard-working, and often embattled political leader of this blue-collar city of 100,000, where the biggest industrial employer is Chevron. McLaughlin had lawyers to confer with, reporters to brief, and then hundreds of out-of-town visitors to greet. Some had never been to Richmond before and one traveled all the way from Vermont to speak truth to power and then get arrested here. In a one-two punch against Richmond's century-old refinery, McLaughlin first called a press conference on Friday to announce that Richmond was suing Chevron. Twenty-four hours later, she marched to the oil company's main gate with 350.org co-founder Bill McKibben and several thousand other global warming opponents. There, more than 200 protesters engaged in peaceful civil disobedience, with the best-selling author from Middlebury College leading the way. The biggest anti-Chevron demonstration in Richmond's history was organized by 350.org, as part of its nationwide "Summer Heat" campaign. To its credit, the sponsoring organization worked closely with the Richmond Progressive Alliance (RPA) and other groups to insure that local concerns were properly linked to national and international ones. han 15,000 people in the Richmond area sought emergency room care after being showered with fall-out from the blast. The U.S. Chemical Safety Board uncovered evidence that, more than a decade ago, Chevron's own engineers recommended repair work on the corroded pipe at fault. Cal/OSHA cited Chevron for eleven "willful" safety violations and imposed the largest fine in the agency's history, a one million dollar penalty that the company is contesting. Chevron says it has paid $10 million to reimburse local hospitals and satisfy some of the 24,000 claims filed by individuals affected by the fire. It also just pleaded no contest to six charges filed by state and local prosecutors and agreed to pay $2 million in fines and restitution. Richmond's attempt to seek further compensation for its citizenry led to a settlement proposal reported to be $10 million or less. (To keep that amount in perspective, please note that Chevron just reported slightly depressed second quarter profits of $5.37 billion!) In July, the often-fractious city council voted unanimously to pursue environmental justice before a judge and jury in Contra Costa County Superior Court. Richmond's damage suit alleges that last year's mishap reflected "years of neglect, lax oversight, and corporate indifference to necessary safety inspection and repairs." The colorful 2-mile march on Saturday focused attention on Chevron's past misbehavior in Richmond and its continuing role in global warming everywhere. Student and c ommunity activists, 350.org supporters from throughout northern California, and a lively contingent of trade unionists assembled near the city's BART station. Their banners and signs highlighted the demands of earlier "Summer Heat" protests in Maine, Michigan, Massachusetts, Utah, and other states: "No more toxic hazards, no Keystone XL pipeline, no refining tar and or fracked crude-Yes, to a just transition from fossil fuels to union jobs in clean energy!" Full article will be available on CounterPunch on August 6.. Many people had to do great work behind the scenes in order to make the Saturday Demonstration against Climate Chaos. I don't know most of them. I would like to acknowledge as a representative of all those behind-the-scenes workers and creators the people most responsible for the art and beauty of the demonstration. Their coordinator was David Solnit who is known for his thinking as well as his doing. Honor to work with everyone! Thanks to Mona Caron and Julie Searle who coordinated the street mural today--and Mona took my favorite photos of today (along with the design for the 4x8 foot ten foot high Chevron sign--since they always hide their name during protest). Also big thanks to the 40 folks who came out this week to make and assemble the art we marched with today. Big thanks for the designs and help silkscreening of picket signs and flags to Santiago Armengod and Jesus Barraza. A tip of the cap also to Brooke Anderson who did a phenomenal job of organizing an impressive labor contingent. So let these thanks also go to the many people who spent many hours at organizing meetings, doing the the press work, serving as marshals, playing instruments, getting sound equipment, and all the organizations that pulled together to make August 3 such a big success. Both Nat Bates and Chevron use the same words to describe the City Council - that "it is dysfunctional." The dictionary definition of "dysfunctional is "not working." The truth is that the Council has accomplished a great deal in the past two years. It hired an excellent lawyer and voted unanimously to sue Chevron. It has worked on the LBNL move to Richmond, It is getting nationwide attention for the city that tries to do something about foreclosures, it has adopted policies that have helped bring crime down. It has passed a leading Ban-the-Box ordinance to do something real to help those returning from prison. Our job training programs get national attention. Our Bay Trail program is second to none. And so on. Yes Council meetings are painful. But that is largely because two Councilmembers, Bates and Booze, and their supporters would like to make the Council dysfunctional. Since we have a Council willing to stand up to Chevron, that is in Chevron's interest also and they contribute heavily to support for these two Council members. Fortunately the Mayor and the rest of the Council have figured out how to keep moving the city forward despite the disruptive tactics and lead the way in solving problems facing cities throughout the country. WHEREFORE, Plaintiff prays judgment against Defendants, and each of them, as hereinafter set forth below. 10. For such other and further relief as the Court may deem just and proper. 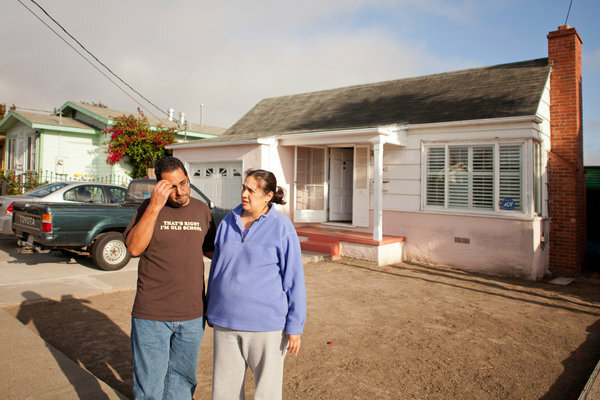 Robert and Patricia Castillo paid $420,000 for a three-bedroom, one-bathroom home in Richmond, Calif., in 2005. It is now worth $125,000. owners, who can be forced to sell their property to make way for a new highway or shopping mall. But now the working-class city of Richmond, Calif., hopes to use the same legal tool to help people stay right where they are. Gayle McLaughlin, the former schoolteacher who is serving her second term as Richmond's mayor. Scarcely touched by the nation's housing recovery and tired of waiting for federal help, Richmond is about to become the first city in the nation to try eminent domain as a way to stop foreclosures. "We're not willing to back down on this," said Gayle McLaughlin, the former schoolteacher who is serving her second term as Richmond's mayor. "They can put forward as much pressure as they would like but I'm very committed to this program and I'm very committed to the well-being of our neighborhoods."